Though I really don't believe in new year's resolutions, I have made a promise to myself to: work less; play with my dogs more. You smile at me; I see love in your eyes. What do you see in mine? Do you see a spirit? A soul inside, who loves you as no other in the world could? A spirit that would forgive all trespasses of prior wrongdoing for just a simple moment of your time? So many times, you have been saddened by the words you read on that screen, of others of my kind, passing. Sometimes we die young and oh so quickly, sometimes so suddenly it wrenches your heart out of your throat. Sometimes, we age so slowly before your eyes that you may not even seem to know until the very end, when we look at you with grizzled muzzles and cataract clouded eyes. Still the love is always there, even when we must take that long sleep, to run free in a distant land. The text is so wise, it must have been a dog that wrote it! that was incredible! Thank you for sharing! 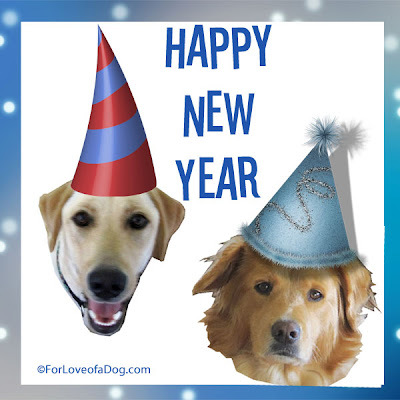 HAPPY NEW YEAR MY FURIENDS!! What a wonderful reminder to live in the moment and enjoy and lick of a dog or the soft love that doggies give. I just gave Sage a big hug after reading that. Thanks for sharing and Happy New Year! I love this and passed it on. Thank you! and Happy New Year!